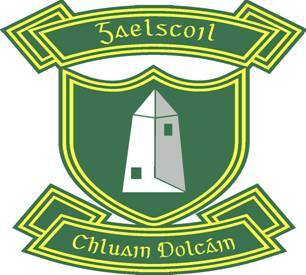 Bhí spás cearnach ag taobh na scoile agus sceach amháin ag fás ann. Ní raibh cuma ró-dheas ar an áit seo agus tháinig an scoil ar phlean gairdín scoile a dhéanamh as. In Earrach na bliana 2002 cuireadh tús leis an obair. Glanadh an áit le cabhair ó thuismitheoirí, múinteoirí agus páistí agus cuireadh plean le céile. Cuireadh isteach ualach mór cré ag an mballa, agus leagadh amach an gairdín. 'Sé an plean a bhí ann ná sampla beag d'áiteanna dhifriúla a chur le chéile mar áis do na múinteoirí agus eolas imshaoil á mhúineadh acu. Rinne fear an tí na scoile, David O'Connor, nó DOC mar ab fhearr aithne air an obair ag an am. Rinne Tánaiste Mary Harney T.D. oscailt oifigiúl ar an 8ú Aibreán 2002. Ba chúis bróin duinn go raibh DOC imithe leis ar shlí na fírinne ag an am ach ainmníodh an gairdín i gcuimhne air, "Gáirdín Doc". Faigheann na páistí ar fad deis iontach bheith páirteach i saol an ghairdín agus i saol chuile rud beo ann. An unused space lay at the side of the school. This area was not particularly attractive so the school decided to create a school garden there. In the Spring of 2002 the work commenced. With help from the parents, teachers and children the place was cleared, cleaned up and a plan was devised. Soil was added and the garden was laid out. The concept involved creating a collection of small different areas that the teaching staff could use as a resource to compliment the teaching of Environmental Studies. The then caretaker of the school, David O'Connor, or DOC as he was more affectionately known, invested a huge amount of effort and work in the project. The Tánaiste Mary Harney T.D. officiated at the official opening of the garden. It was the cause of sadness on the day that DOC had passed away by this time. However, the garden was named in his memory as "Gairdín Doc". All the children get to experience the wonders of nature through a very immediate and 'hands on' approach. An Tánaiste, Mary Harney, T.D.